John Brinkman, a colleague of mine at Adobe and the LiveCycle Forms Architect no less, has decided to start a new blog on form design. It looks like he will be concentrating on on best-practices relating to form design and scripts based on past experience with forms from various customers (in other words, based on real-world forms). Hi first post relates to exclusion group-like functionality using any type (or combination) of fields in a subform where each field is treated as a mutually-exclusive radio button. Check it out, it works very nicely! A frequently-asked question is, "how do I modify the email in an email submit button?" 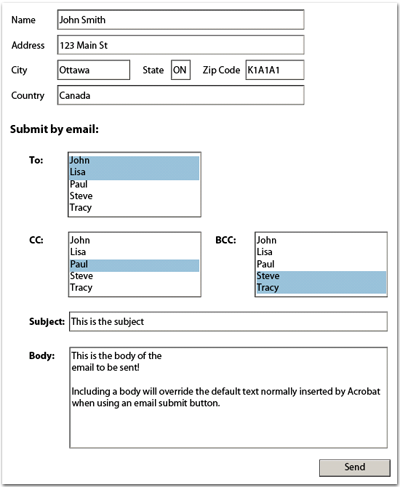 Usually, the reason behind the question is that a form should either be routed to a specific person depending on data entered at runtime (so you can’t predict the data and therefore you can’t set the email submit button accordingly at design-time) or perhaps the form even presents a list of possible recipients and the user must choose which person to send the submission data to. The secret to changing the email recipient for an email submit button (or even changing it for a regular button which you’ve turned into a submit button using the "Object palette > Field tab > Control Type > Submit property") is to set the "target" attribute of the <submit> node that is part of the button’s Click event. The "target" specifies the URL to which the data will be submitted. HTTP and mailto are valid protocols. In XFA, the difference between a regular button with Click event script and a submit button which submits form data when it’s clicked is that the submit button’s Click event has a <submit> node instead of a <script> node. Changing the recipient is done simply by setting the submit button’s target appropriately, following the rules of the protocol you wish to use. In this case, we’ll be using the mailto protocol. Of course, we can do much more than change the recipient: We can actually specify multiple recipients, CC some others, BCC others still, specify any subject we want and even specify a customized email body (message)! All that needs to be done is to apply the mailto protocol when specifying the submit button’s target. The most difficult part of all this is finding the Click event (since there could be multiple <event> nodes specified on a single field, one for each event that does something) and locating the <submit> node inside. To illustrate how this is done, I’ve created a sample form that submits an address block as data and provides fields for specifying the recipient(s), CC list, BCC list, subject and body of the email. In order to accomplish this, I used the two-button submit technique where a regular button is used to set the properties on a hidden email submit button. Doing it this way also lets me easily prevent the submission if there are no recipients ("to") selected. (Note that the To, CC and BCC fields are multi-select list boxes so you can choose multiple email addresses.) You’ll be interested in the script in the "Send" button’s Click event. Minimum Requirements: Designer 8.0, Acrobat/Reader 8.0 for this form since it uses functions that are part of the new List Object API which was introduced with the 8.0 versions however you could access the selected items differently and get this to work in previous versions as well. XFA Spec (page 353 in version 2.7). 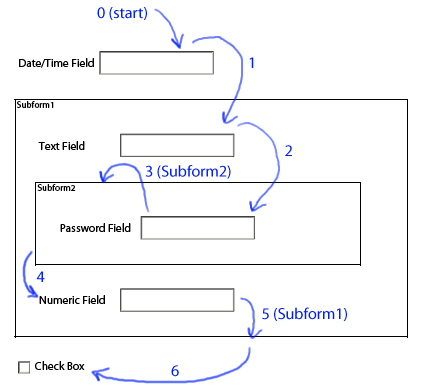 Minimum Requirements: I created this form in Designer 8.1.1 SP2 and tested it in Acrobat Pro 8.1.2. What About the Other Field? A common need in forms is to ask the user to choose between a set of options within a list, be it a radio button list, list box or drop down list. What’s more is that these lists often include an “other” option to let the user specify something more specific that isn’t included in the list. The trouble is, how do you ensure that the user fills-in the “other” field prior to submitting their form? The first thing I did was create my sample form using Designer 8.1 and Acrobat 8.1. That was very easy and just as straight-forward as I expected it would be: One radio button list, one list box and one drop down list, each set to be required and with their own “other” item and script to show their respective “other” field (and make it mandatory) when their “other” item is selected and hide it (and make it optional) when their “other” item is de-selected. Add a submit button and Acrobat/Reader 8.1 automatically takes care of preventing the submission if any required field isn’t filled. To keep things simple, each list field has script that detects when the user either selects the “other” item or an alternate item and sets the presence and mandatory properties of its “other” field to be visible/required or invisible/optional, respectively. Unfortunately, I didn’t have the same kind of experience getting this form to work in Acrobat/Reader 8.0 or earlier. The first thing I did, since my 8.1 sample form doesn’t use any functionality only available as of Designer/Acrobat 8.1 (in fact, it uses XFA properties and script functions that have been available since Designer/Acrobat 7 and likely even earlier), I simply used Designer 8.1 to set my form’s Target Version to Acrobat/Reader 7.0.5 and figured I would open it in Acrobat 7.0.9 and all would be good. Well, that wasn’t the case. Aside from Acrobat not respecting the “required” setting on the radio button list (which was expected since required radio button lists weren’t supported until Acrobat 8.0), I discovered a very strange behaviour in the list box where simply having a statement within its Change event that sets a field’s mandatory property to “error” will always result in that field being required, as far as Acrobat/Reader is concerned, even if the statement doesn’t appear ever to be executed on form initialization. The result is that selecting an item other than the “other” item in the list box and attempting to submit the form prompts Acrobat to cancel the submission because a required field isn’t filled. The problem is that the required field is the list box’s “other” field which is hidden from view because it isn’t supposed to be required. Finally, there was also another issue with list boxes that have Change event script: Their value is never committed to the Data DOM, which means that the list box always appears to have no value and that also prevents the user from being able to submit the form because the list box appears never to have been filled (even though an item is clearly selected). List boxes with Change event script don’t commit their value to the Data DOM (this is also resolved in Acrobat/Reader 8.1). Issue #1 (required radio button lists not supported) can also be resolved although it requires a little more work. One alternative is to use the “Two Button Submit” Technique I described on a previous post on Complex Validations, which is what I implemented in my 7.x sample form. Since all new documents created in Designer are based on templates and that each template comes with its own set of processing instructions, modifying the processing instruction in the template would effectively modify the default scripting language on all new forms based on that template. Going one step further and making that modified template your default template would ensure makes things even easier when you’re creating new forms. In Designer, you use the Template Manager to organize your templates. You can access the Template Manager from the Tools menu. Create a new document based on the template you wish to modify. Save the new document as an "Adobe LiveCycle Designer Template (*.tds)" file. If you want to replace an existing template (say "Letter"), use that same name as the file name for the new (modified) template file you’re saving. Using the Template Manager, select the tab pertaining to the group in which you want to add your new template. If you’re wanting to replace the "Letter" template, for example, select the "Standard" tab. Right-click in the list panel and select "Add Template…". Select the template you just saved and it’ll be added to Designer’s "template store". Note that if the name of your new template file is the same as an existing template in the group you selected (e.g. the "Letter" template in the "Standard" group), you’ll be prompted to overwrite the existing template. One important thing to note in the way Designer handles templates is that any template file you add to the Template Manager gets copied into the "template store" which means that new documents based on that template aren’t actually based on the template file in the location where you saved it but rather on the copy that was placed in the "template store". If you’re wondering what the "template store" is, it’s actually a folder inside Designer’s Application Data folder on your system. While I don’t encourage you to look in there (because you might see things that look interesting but you shouldn’t be playing with ;), if you find them, then you should also be able to open them directly in Designer and modify them without having to create a separate copy.